I saw these on Pinterest; where else, right?! I decided to give them a try for a Super Bowl party we're going to. I made them the day before because I wanted to make sure they were good enough to take over. I never like to make a recipe the day of without trying it out first because it could be a major dud! 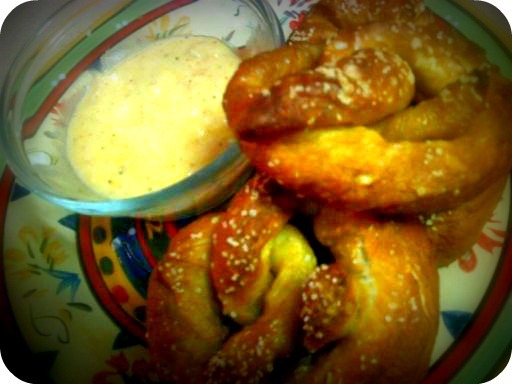 I can tell that these are so yummy that we had none left and even decided to just have them for lunch.. pretzels for lunch! Yummy! In fact, the picture is taken with my super old camera phone, so I'll be taking better pictures to share with you later today when I make these again.Wwe couldn't wait to eat them so my phone was the closest camera I had. Oh, and these seem like a lot of work but they're not much at all, just time consuming because of having to let the dough rise. Try them out! In the bowl of a stand mixer fitted with the dough hook, combine all ingredients for the dough. Make sure you are using rapid rise yeast, or you will need to proof your yeast before mixing. Mix on low speed until combined and then knead about 5-7 minutes on low speed until the dough is smooth and elastic. Prepare a separate bowl by coating with olive oil, transfer dough to bowl, turning to coat evenly. Cover the bowl with plastic wrap and set in a warm place to rise for about one hour or until doubled in size. Punch dough down, recover and let rise approximately 30 minutes more. In a large low pan (a 12" skillet with deep sides or a small dutch oven will work perfectly) bring water and baking soda to a boil over medium high heat. Preheat oven to 450 degrees and line a large baking sheet with parchment paper. Separate dough into 12 approximately 2 ounce pieces. Roll each piece into a long string, about 20 inches in length. Fold pretzels into shape, twisting the ends over each other and pressing lightly to seal dough into shape. Transfer pretzels, a few at a time to boiling water, cook 30 seconds on each side, turning with a slotted spoon, drain and transfer to prepared baking pan. Sprinkle with coarse salt and repeat until all the pretzels have been boiled. They don't need much room on the baking sheet as they won't spread much in the oven. Bake approximately 12-14 minutes until dark golden brown. Transfer to a wire rack to cool and serve. In a small sauce pan, melt butter over medium heat. Add flour and whisk to combine, cooking about one minute until smooth. Add milk and chicken stock, whisking to incorporate (If you don't have chicken stock just use 3/4 cup of milk). Add garlic, cumin, garlic powder, onion powder and cayenne pepper (to taste). Switch to a wooden spoon and stir frequently until thickened, about 15 minutes. The sauce should begin to coat the back of the spoon. Remove from heat and stir in cheese. Add salt and pepper to taste.